In 2000, the world got hooked on M. Night Shyamalan's intriguing story of security guard-turned-protector David Dunn in Unbreakable. In 2016, he took the cinemas by storm with the thrilling sinister personalities of Kevin Wendell Crumb in Split. Now, the genius filmmaker connects both of his supernatural narratives in an all-new comic-book thriller, Glass. The renowned writer-director returns to the big screen with the much-anticipated conclusion of his original cinematic universe that started 19 years ago with Unbreakable. Shyamalan brilliantly weaves the stories of his extraordinary beings together in one mind-blowing film that offers a fresh, contemporary alternative to today's superhero epics. "I've never done anything like this. It was really different for me to kind of bring characters from two different movies that I had invented earlier and then create a third version," Shyamalan shares. The visionary director wanted to create a trilogy that was unlike any other, and what took years in the making finally gets a riveting culmination in Glass. Film buffs who have followed David Dunn, Kevin Wendell Crumb, and Elijah Price in the last two movies of the Unbreakable series can find closure about their broken identities in Glass. 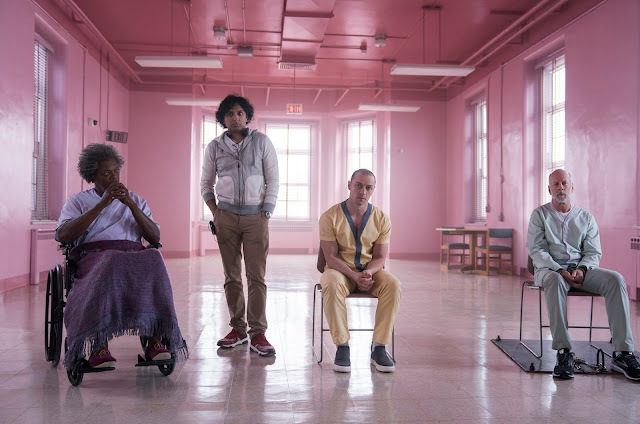 Shyamalan admits, "The movie is really about marginalized characters and them coming to find a place in this world that they feel important, and that they are very important even though the world has told them otherwise." Glass follows where Split took off and finds Dunn's vigilante hero persona, The Overseer, in pursuit of Crumb's destructive superhuman figure, The Beast. In a series of thrilling encounters, the two men are captured and detained in Raven Hill Memorial Psychiatric Research Hospital under the care of Dr. Staple, where Price has been living for the past 16 years. Bringing to life these powerful characters, Bruce Willis reprises his role as David Dunn, Samuel L. Jackson as Elijah Price or Mr. Glass, and James McAvoy as Kevin Wendell Crumb and his multiple identities. Joining the all-star cast are Spencer Treat Clark and Charlayne Woodard who reprise their roles as Dunn's son and Price's mother, with newcomer Sarah Paulson as Dr. Ellie Staple. Willis expresses his excitement on being able to return as the standout invulnerable David Dunn in Glass. He shares, "Night creates characters that are unique and memorable and feel personal. I was just as thrilled to play David Dunn as I was the first time I played him." Meanwhile, McAvoy shares his sentiment on what makes Shyamalan's trilogy different from other superhero franchises. "Unbreakable and Split were both, in a way, deconstructionist superhero movies. What was great when I got the script for Glass was that it was taking super people, super hero, and super villain archetype and putting them in a very different kind of movie, and I think that's exciting." Comic-book thriller fans can expect the epic finale of an original trilogy and modern cinematic universe that is trademarked Shyamalan. While Unbreakable and Split focus on two men discovering their strengths, Glass hinges on the root of identity and challenges the idea whether the mind can shape and influence one's physical realities.